A blog worth repeating... over and over and over again. Every day I thank God for the many blessings he's bestowed upon our family. I pray that He uses me to return the blessings by being there for others in need. Then, more often than not, I find myself waiting and wondering when God is going to do just that; when He is going to use me to make a real impact on a person's life. I just went about my days wondering when I was going to be used for something "big" that I ended up not doing any of the little things that count just as much! It hit me one day when I was in the drive-through line at McDonald's. Looking in the mirror I saw behind me, an elderly couple who ordered after me. When I went up to the window to pay, I asked if I could pay for the car behind me as well. I told the cashier to tell the couple that their order has been paid for by someone who is just doing a "random act of kindness". I thought maybe the couple behind me would, in turn, pass it on one day or "Pay It Forward". Even though I didn't know them or know if they were "in need", it still felt wonderful to be able to give. And the good part about it is I still felt I "received" as well. The feeling was so nice that I have done this quite a few more times since. Even though I don't think this is making a "big" impact, who's to say... the couple behind me might just think so. * Recently, I went to one of the retail stores and saw, as you often do this time of year, volunteers for the Salvation Army ringing a bell, hoping for donations. As I parked my car, I sat and witnessed the many people walking right past the volunteer without a second glance. Yes, in these hard economic times, no-one can know for certain what kind of financial stress people are under. As I sat and thought about myself, my warm bed, having plenty of food to eat, and clothes to keep me warm, the thought of others who do not have any of these made it easy for me to reach in my wallet and take out even one dollar to donate. One dollar isn't a lot, but a dollar or two each time you go can make a difference. Decide to do this at least once this season and before walking away, make eye contact with the volunteer and sincerely wish them a good day or wonderful holiday season. With so many other people passing them by, some of these volunteers might not hear that often. * Several people I know have decided not to decorate for Christmas. Either their children are all grown and have moved away or they're just not in the Christmas spirit due to other unfortunate circumstances. Although I can't imagine not decorating and being without Christmas spirit, I do understand why some feel there's no use or no need. However, I do pray that each person who says "What's the point?" finds the spirit of Christmas this season by doing something for someone else; taking a tray of cookies to a neighbor or a friend, putting a dollar in the Salvation Army donation pot, paying for an order behind them in the drive-through line, or just calling someone they know who are going through even a more difficult time and could really use a word of encouragement. * In most cities, around this time of year, there are Angel trees set up in stores or churches with tags on them asking for gifts for someone in need. I will never forget taking one of these tags off an Angel tree at our church one year to buy for an eight-year old boy. Listed were his clothes sizes and shoe size but the last thing listed was a "wish" item that the eight-year old boy could ask for - something that he really wanted for Christmas. When I read the item it was hard for me to hold back my tears. Thinking he was going to ask for the latest toy for boys his age, I was speechless when I read that the item he most wanted was socks. During one of the busiest times of the year, it is easy to go on about our hectic lives without a second glance at those who need us to pause, look around, and really see those who are truly in need of some Christmas spirit. Give hope to someone this Christmas. Even if you feel you don't have a lot of extra to share. It may even help you find the Christmas spirit that was lost within yourself. A beautiful, yet simple, dish that is packed with protein and marinated with flavors that will make you think it came from an expensive restaurant! Preheat oven to 425 degrees. 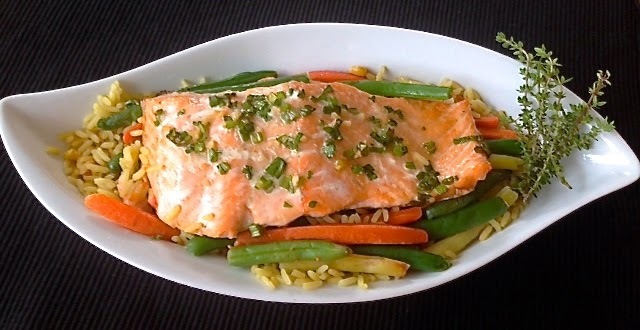 Place salmon in a glass baking dish. Pierce salmon with a fork so marinade will saturate all throughout. In a small bowl, combine the rest of the ingredients. Pour bourbon marinade over salmon and place in the oven. Bake for 15 to 20 minutes, until salmon flakes with a fork. Serve with rice, vegetables, or your favorite side dishes. Enjoy! If you'd like a printer-friendly version of this recipe, Click Here. This appetizer will have people demanding the recipe, so have it handy. Preheat oven to 350 degrees. In a large skillet, cook bacon until crisp. Let cool and crumble 3 of the four pieces. Set aside. In a small sauce pan, heat apricot spread and apple cider vinegar over medium-high heat. Let come to a boil and stir for 1 minute. Add 3 slices of the crumbled bacon. Reduce heat and let simmer for 2 to 3 minutes. Place 1 tsp. brie cheese in the bottom of each Fillo cup. Top evenly with jam mixture and bake for 10 minutes. Remove and crumble and sprinkle remaining bacon slice on top of each cup. Top with fresh herbs (such as thyme or rosemary) and enjoy! If you'd like a printer-friendly version of this recipe, Click Here. "My goal is to build a life I don't need a vacation from." - Rob Hill Sr.
A delightful and quick recipe to satisfy your sweet tooth. All you need is a great cup of coffee! Preheat oven to 350 degrees. In a large mixing bowl, combine all ingredients except melted chocolate and brown sugar. Spray mini muffin pans with baking spray. Fill muffin pans three-fourths of the way full with batter. Bake for 12 minutes or until a toothpick comes out clean when inserted into the middle. Allow to cool. Drizzle about 1/8 of a teaspoon of melted chocolate on top or sprinkle each cake bite with 1/4 teaspoon brown sugar. Enjoy! If you'd like a printer-friendly version of this recipe, Click Here.